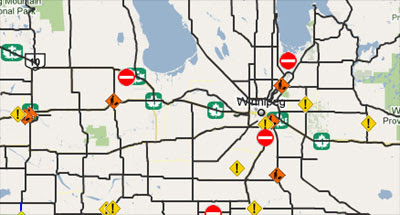 This Google Maps mashup shows highway conditions in the Canadian province of Manitoba. The map shows road closures, current maintenance repairs and roads under construction. The map includes a number of preset zoom options so that you can automatically zoom to locations in the province. If you select the 'show text' option you can also view the current highway conditions in the map sidebar.